Earth Day is a time to focus on going green. Home > Blog > Soundproofing > Celebrate Earth. Soundproof Green. Soundproof Cow is a proudly veteran-owned and operated company based straight in the heartland of South Central Pennsylvania’s agriculture hub. We take our earth and environment seriously. Littering has countless adverse side effects on our society and eco-system. Every proactive step we can take toward cleaning up our homes (even from within our walls, floors and ceilings), our streets and pastures, secures a peaceful and more beautiful future. Our ongoing goals are to help raise awareness and provide the resources. It’s time to rev up your remodeling with recycled products! Why Go With Green: This month, the herd is excited to give back to the Earth Day environmental cause by taking 15% off your favorite recycled products from April 22- May 2, 2016. With Quiet Batt™, Echo Absorber™ and Impact Barrier QT, you can reinvent all your remodeling projects with cleaner, greener materials. Whether they are on sale or not, the solutions they provide remain the same. 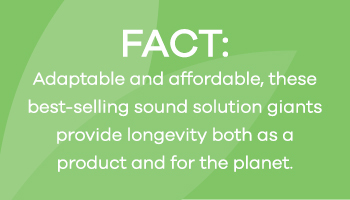 Adaptable and affordable, these best-selling sound solution giants provide longevity both as a product and for the planet. Easy to Handle: Sure it’s earth friendly, but it’s also friendly to the touch: Because a significant portion of the fibers come from materials we’ve already been exposed to rather than formaldehyde and other chemicals, this itch-free product is the perfect solution for DIY installation. Energy Efficient: Instant gratification from sale prices are great. But what if you could save quarterly, seasonally and beyond? Once installed, these products have the capability of keeping your house warmer in the winter and cooler in the summer. Cut back your energy bill, cut back your costs! Ready to start your project? There are dozens of other benefits to Quiet Batt™, Echo Absorber™ and Impact Barrier QT. Going green is an initiative, a state of consciousness. All it takes is one wall of insulation in the right direction. And now that your walls are wide open, let us help you save energy – not just physically with easy-to-install products – but eco-friendly sound solutions that will save the next Cow generation. Hoof on over to our website to Celebrate Earth and Soundproof Green today! Tell them you heard it from the herd.